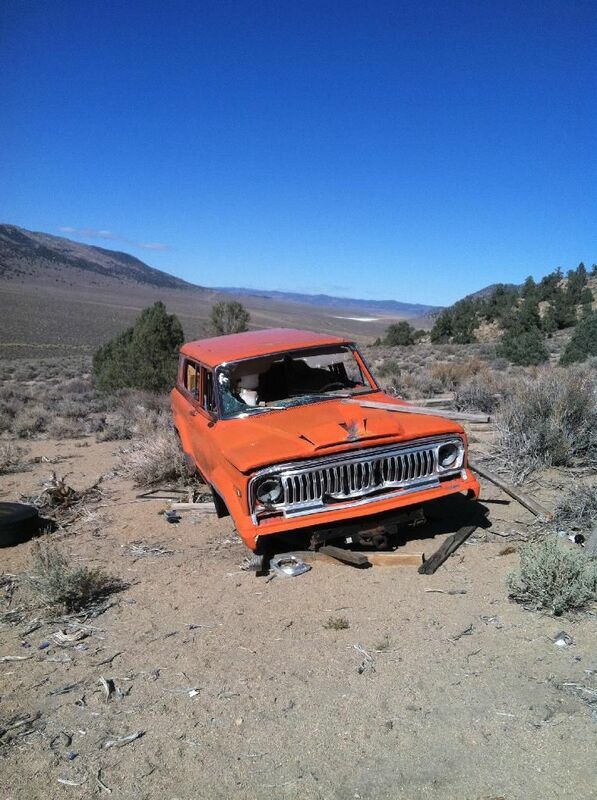 Bug out Eastern Sierra style! 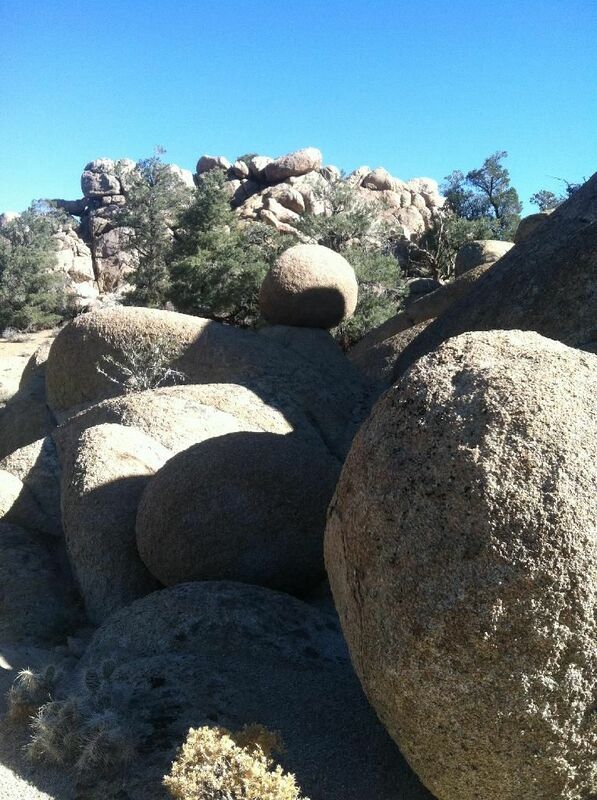 121 acres of California land - Trees, granite rocks, hill-tops, canyons, flats, hunting, hiking, 4x4. Build your cabin, or several. Owners will finance. 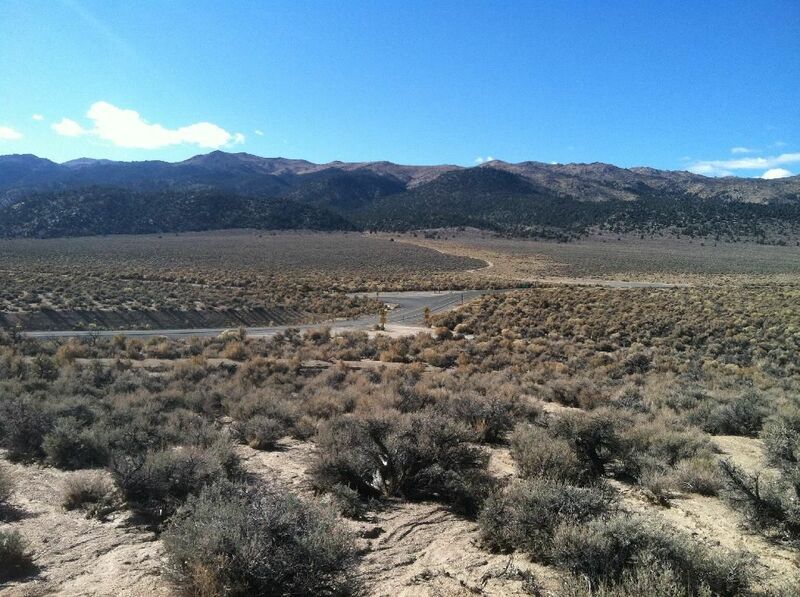 This land is for someone who is looking to build off the grid but with a desire to be close to Mammoth Lakes and other Eastern Sierra communities like Benton Hot Springs and Tom's Place. This property can be divided into 40 acre parcels creating an opportunity for 3 separate parties/families to go in on a joint venture. Owner financing available with $10,000 down. 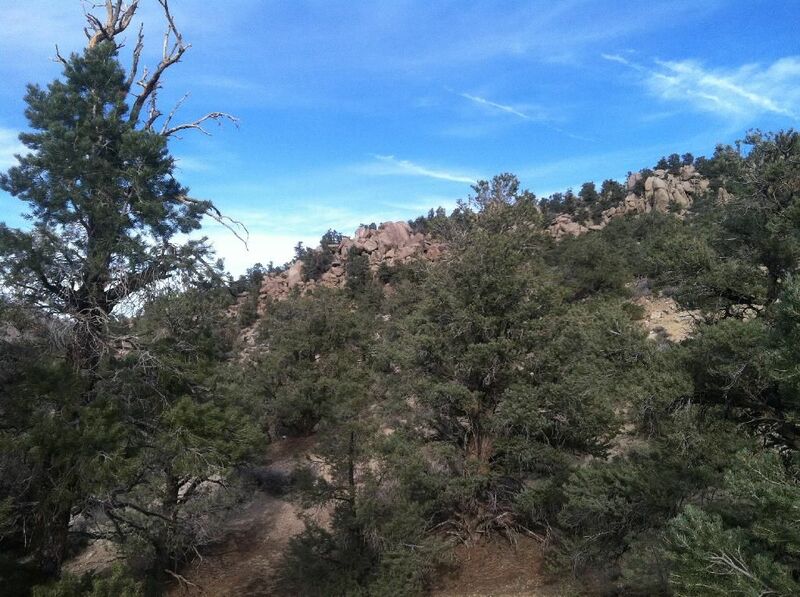 All pictures below are taken on this land for sale except for those noted. More information and photos below. 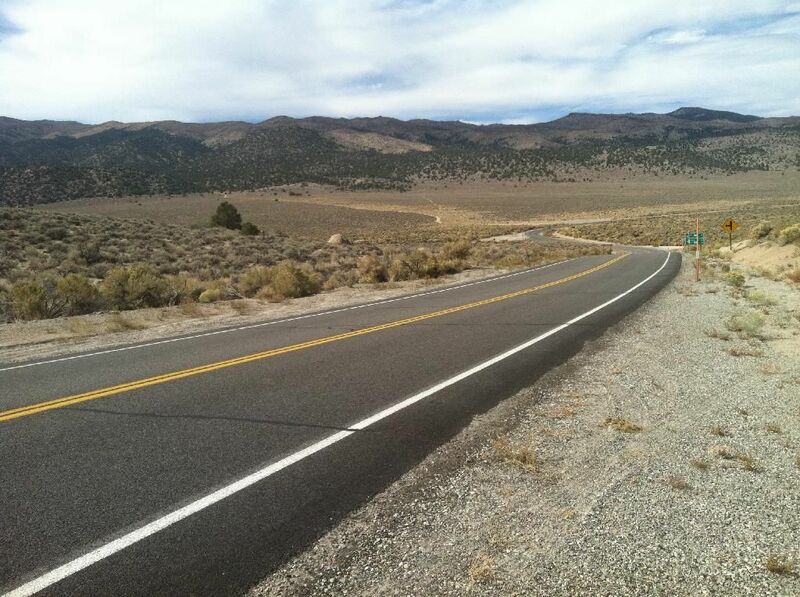 This 121 acre property is located about 35 miles or 40 minutes from Mammoth Lakes on the paved Benton Crossing Road where it intersects with state highway 120. 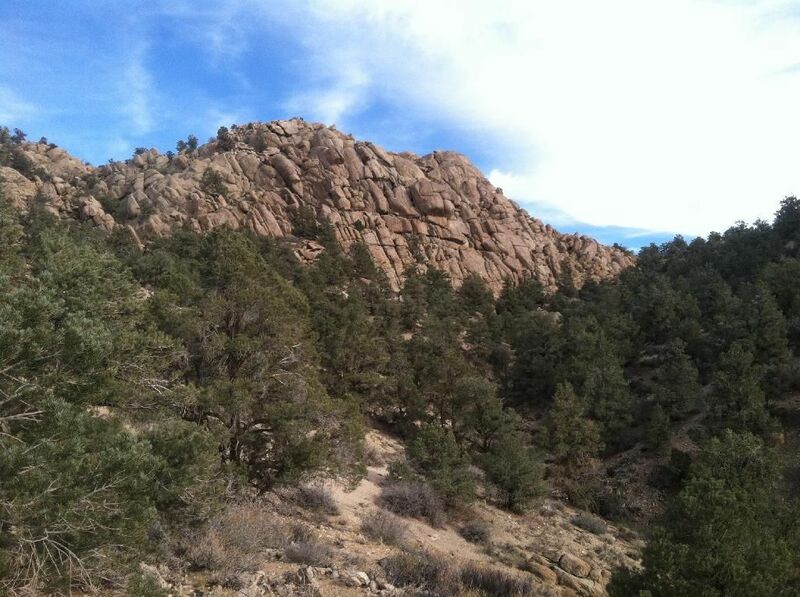 Although most of the land for sale in this area is flat as a pancake this property boasts plenty of topography, numerous rock outcroppings, hills, arroyos, flat building spots, and a mountain of rocks. Benton Hot Springs can be reached in 10 minutes. 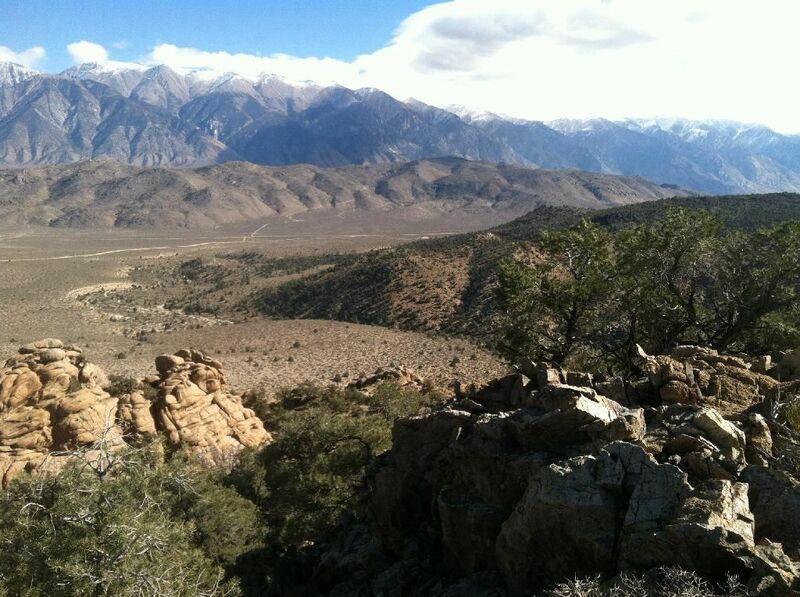 The eastern sierra is home to many different mountain ranges in addition to the sierra nevada. 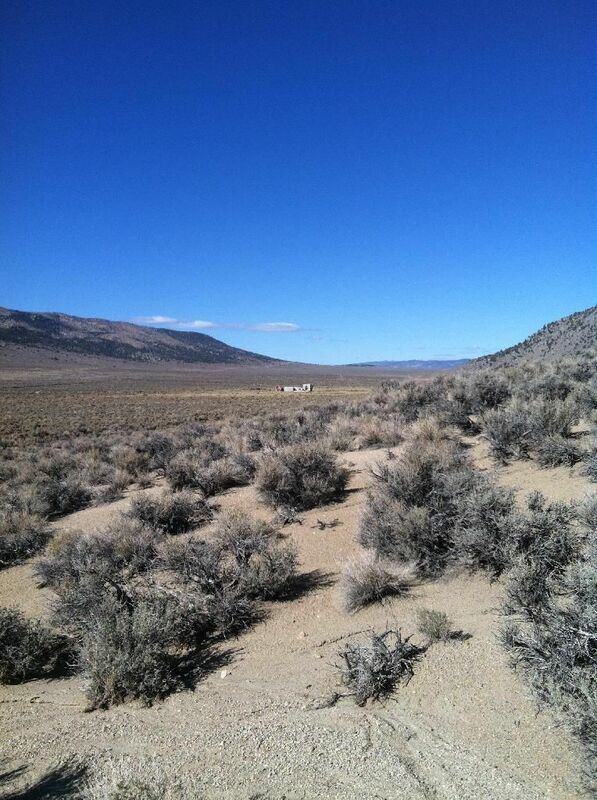 This property lays behind Crowley Lake and Glass Mountains and in the Benton Range. 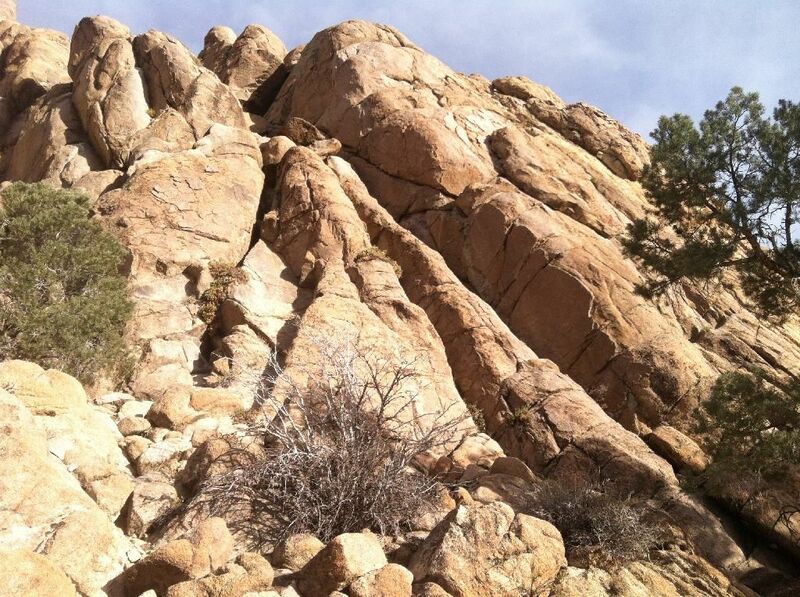 The Benton Range is old granite with many stone formations similar to what is found in the Alabama Hills out near Lone Pine and Mount Whitney. Driving directions from Mammoth - turn at the Green Church and drive past the Whitmore Fields and Pool for about 26 miles. At the first stop sign you reach (highway 120) you are on the land. Park and hike. 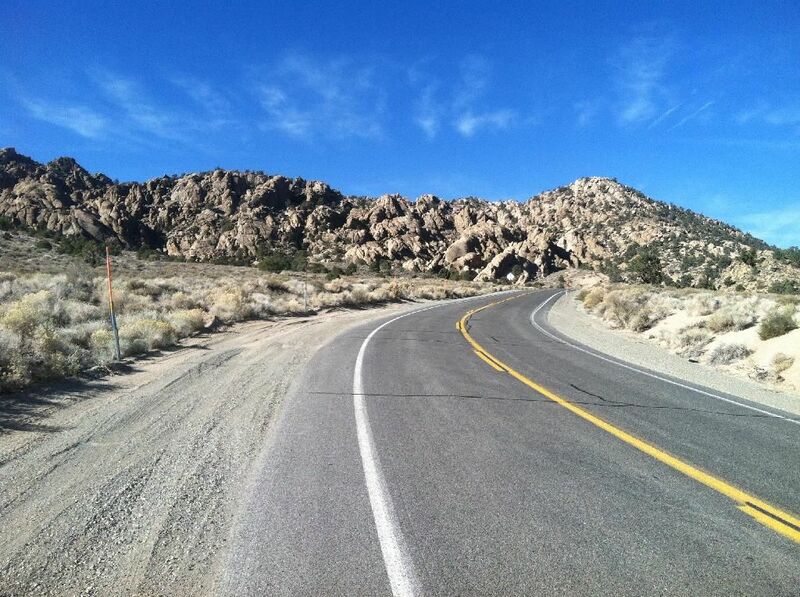 From Bishop - take highway 6 to Benton. Turn left on highway 120, drive through Benton Hot Springs and about 6 miles later make another left onto Benton Crossing Road. 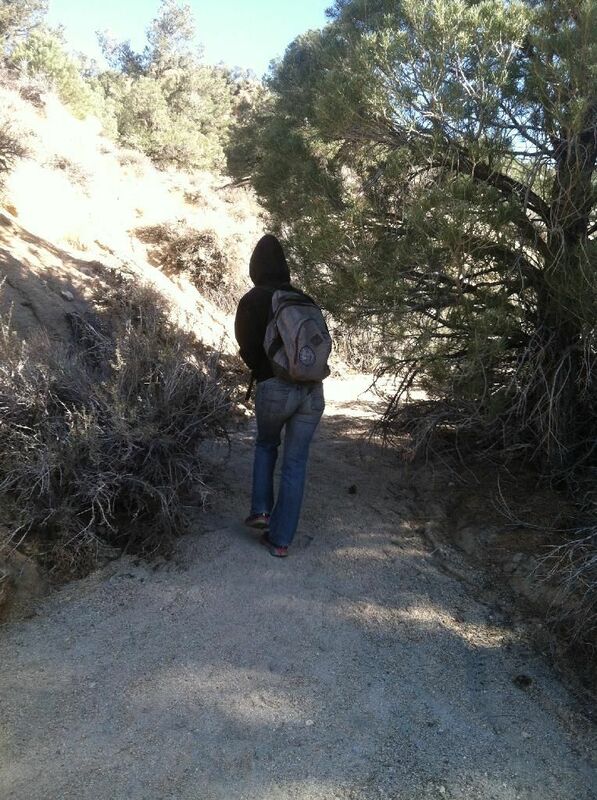 The road that leads to the arroyo hike is about 1/3 mile on the left as well. 4x4 or AWD might be necessary to climb on and off the pavement. Don't get stuck. 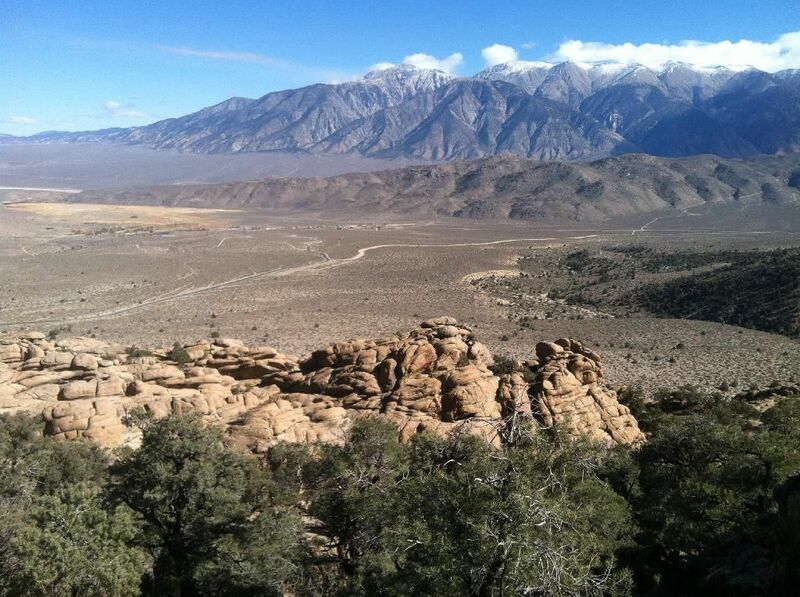 What's remarkable with this property is a popular hiking trail that follows an arroyo (smooth sand wash) up to the crest of the Benton Range and over looks the White Mountains and Benton Hot Springs. 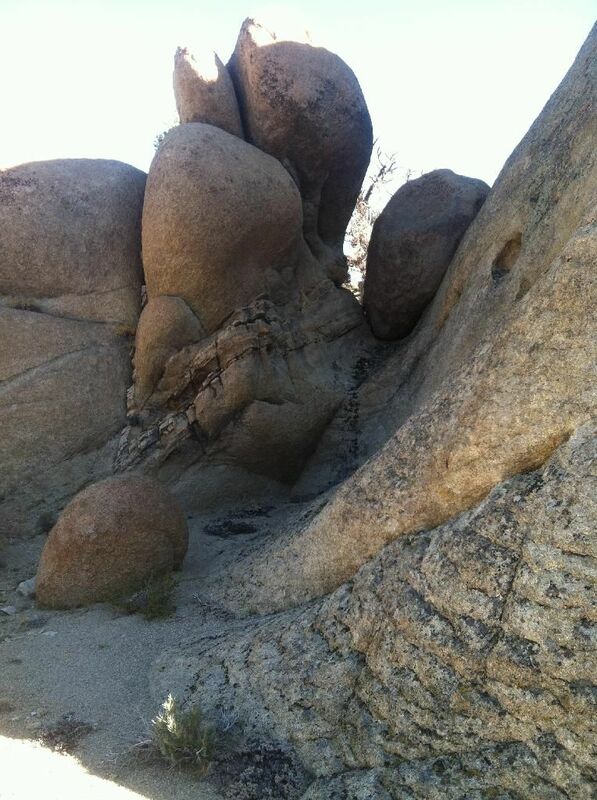 And along that trail are many interesting rock formations that you'll see if you scroll down. 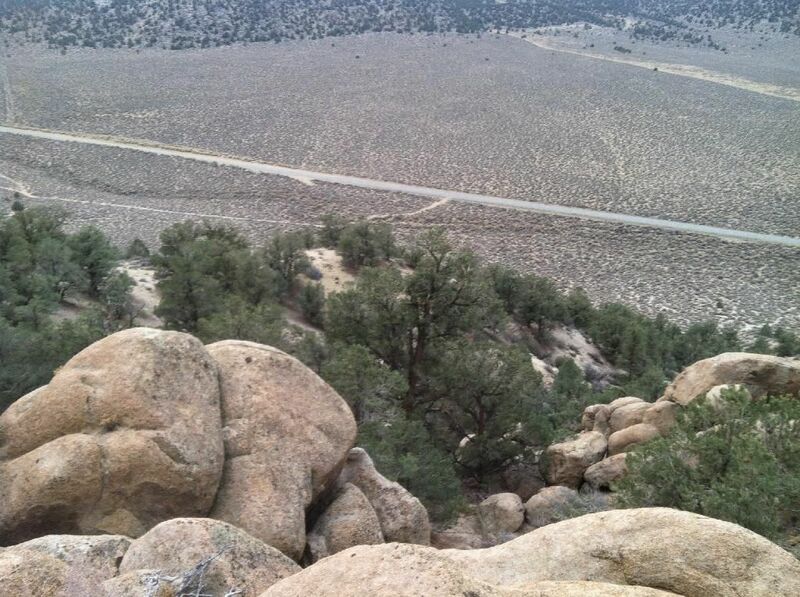 The higher up you go in the wash the tighter it becomes effectively turning around jeeps and 4x4's but still allowing passage of hikers, horses, and motorcycles all the way to the top. View from the property looking down at the property. It's 1/4 mile wide by a little over 3/4 mile long and covers both paved Benton Crossing Road and state highway 120 as seen down below. Below is the paved Benton Crossing Road with one of many dirt access roads on the property. 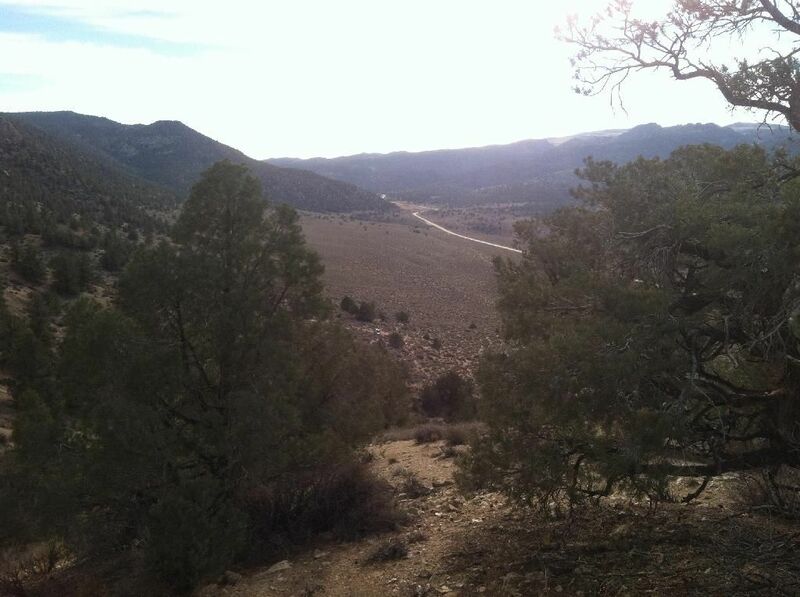 This dirt road shown leads up to the arroyo hike. Every time we go out there there are fresh tire and foot tracks - it's up to the new owners to decide if they will allow this continued access or not. 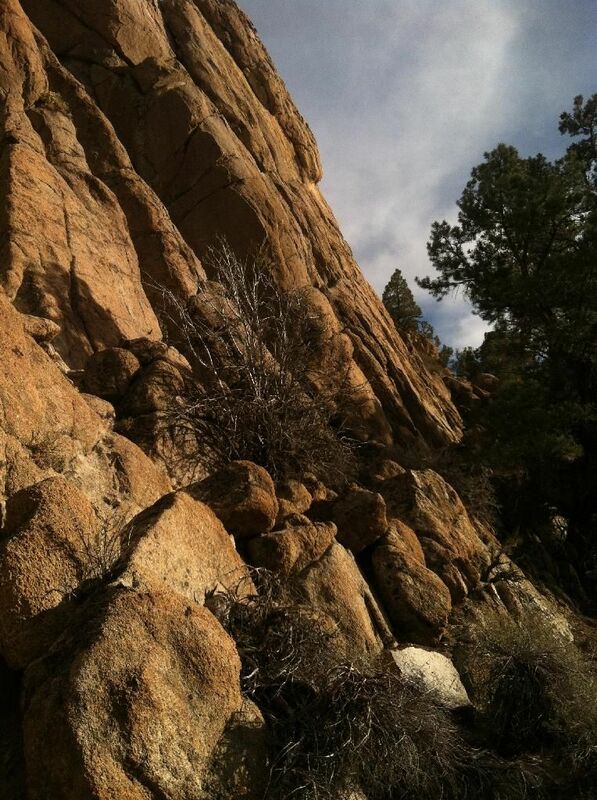 This is the largest outcropping on the land, probably 60-80 feet of vertical granite or more. 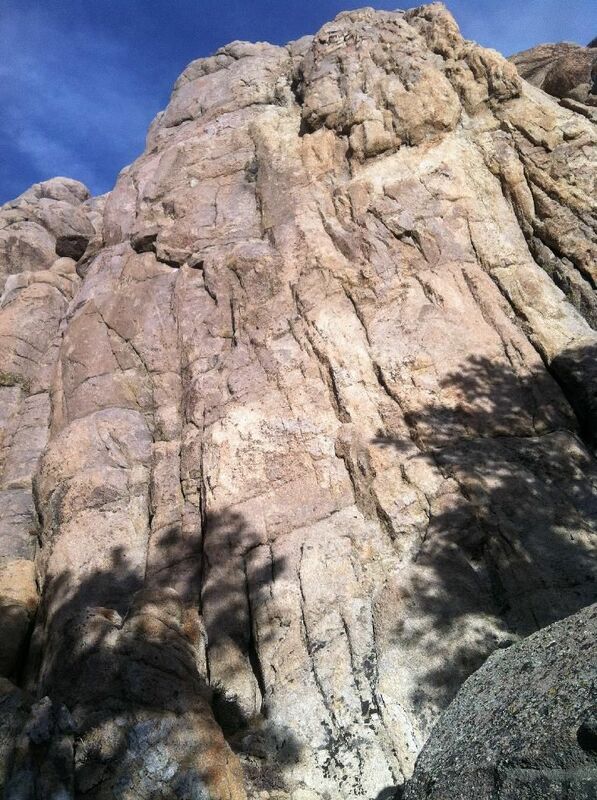 It could easily be top roped for some rock climbing action on private land. Got bolts? 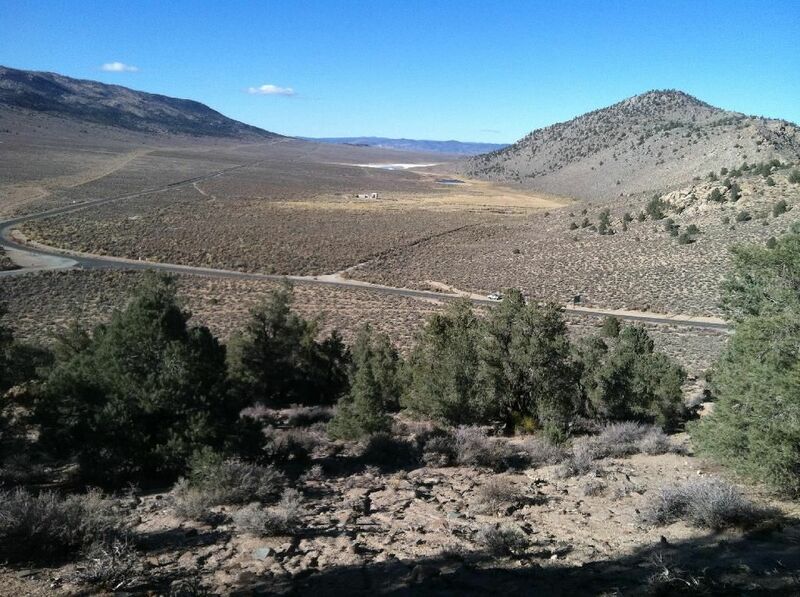 View from property looking towards Mammoth Lakes. Mountains in distance are the back slope of the Glass leading up to Squaw Peak. 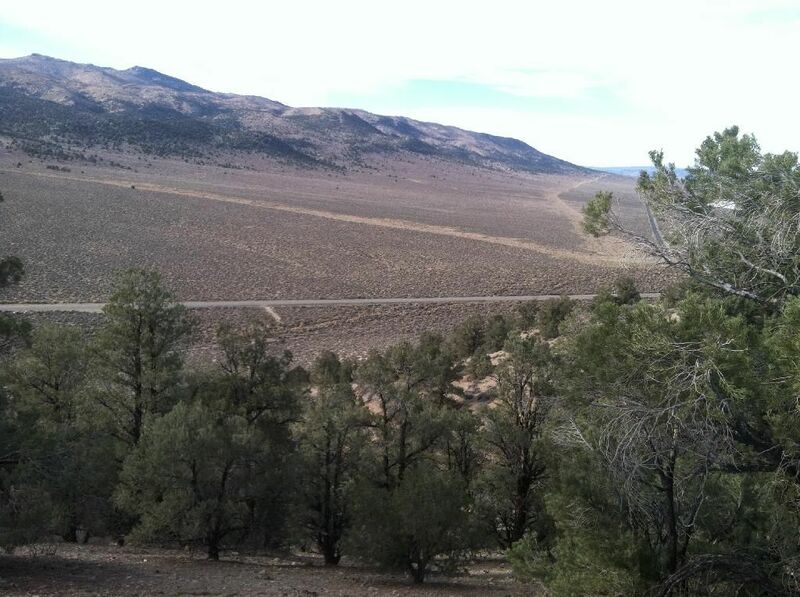 Where the road curves is a 281 acre parcel on the MLS for 1.4 million. We are offering superior land for under $1500/acre compared to $5000/acre. 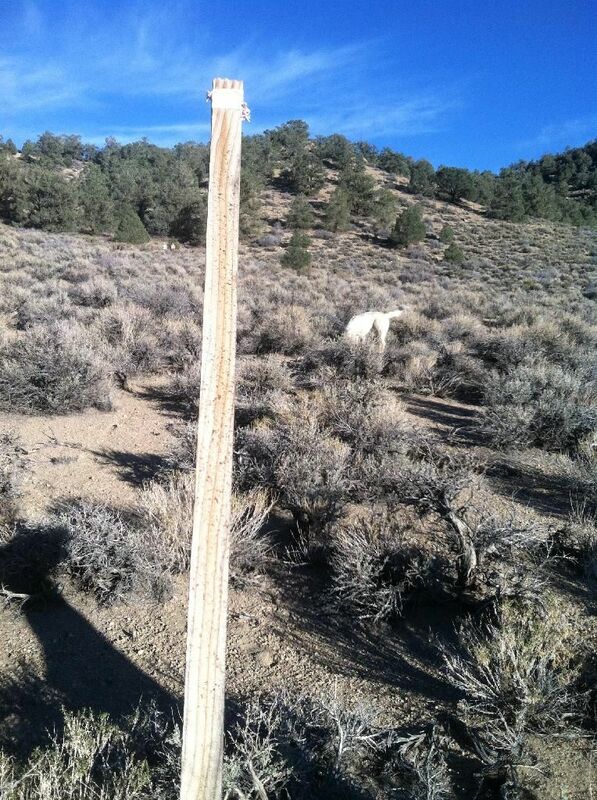 This land is surrounded on two sides by the BLM and by private land owners down below on the other two sides. This photo was taken as we were traversing the top boundary of the property - to go 3/4 of a mile took us one hour and we were moving quickly sometimes jogging it. 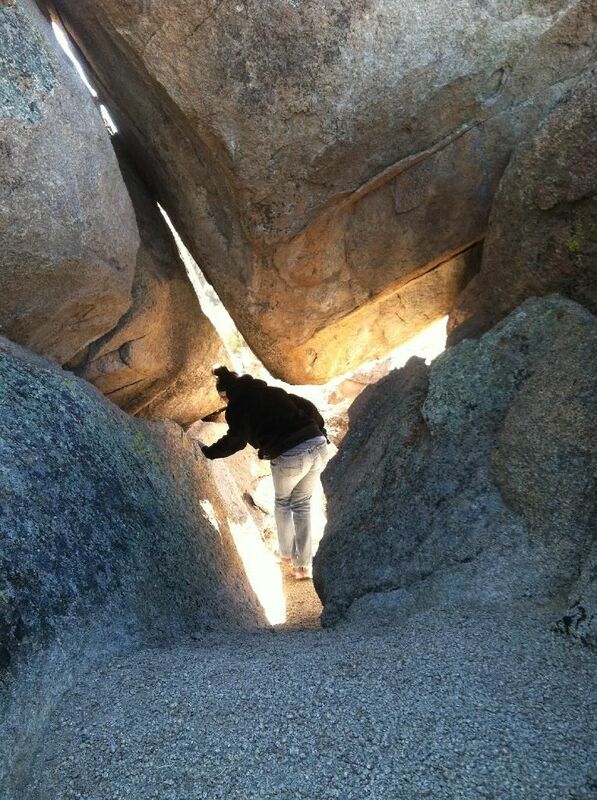 Took long because it was a constant up and down into canyons, over boulder piles, tree thickets, etc. 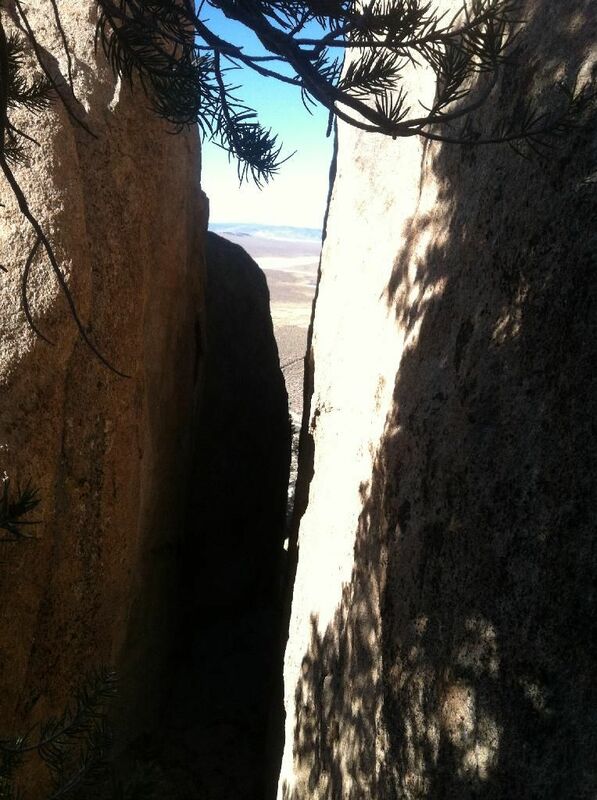 Property line below towards base of mountain top, that mountain is public land administered by the BLM. 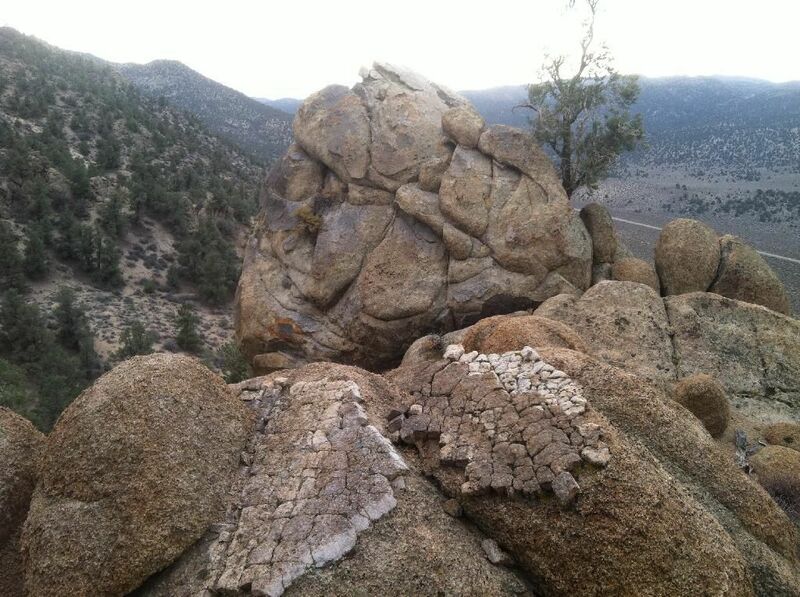 Out of all the local land managers we happen to like the BLM the most because they seem to take an even stance when it comes to managing lands. They strive to be balanced, not overly strict like the USFS and Park Service but more engaged with the public than Los Angeles DWP. Was told by the county he had to acquire a conditional use permit (CUP) to allow nightly rentals. We're the type of neighbors who support that kind of activity, it's nice to be able to make a little money on the side when you can. 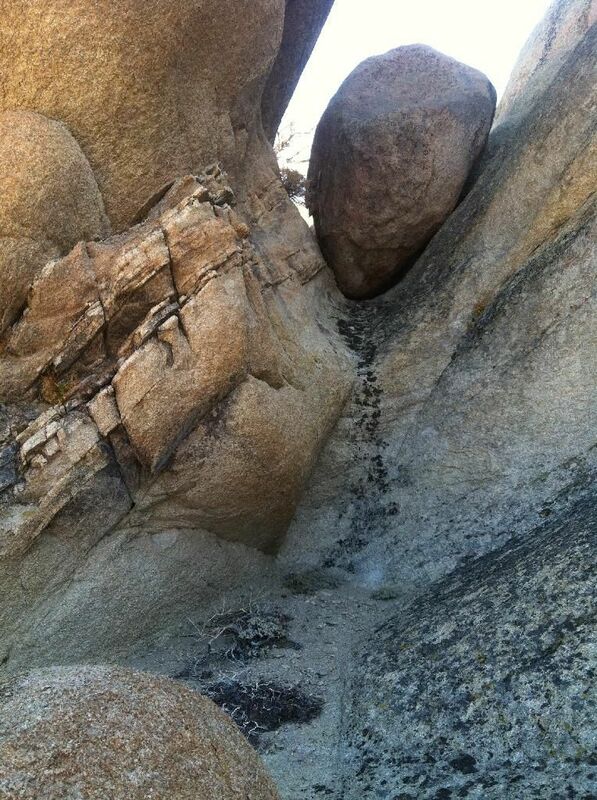 Below if you look close you can see our truck parked off the 120 on our property. 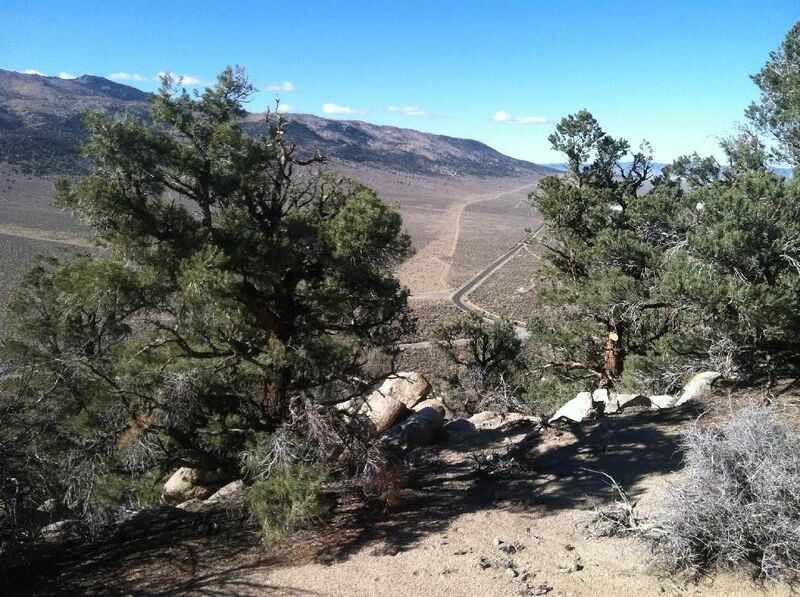 Another shot looking down on the Mammoth Lakes Ranch. OK, now we are down off the 120 where our truck is parked. This is the NW corner. 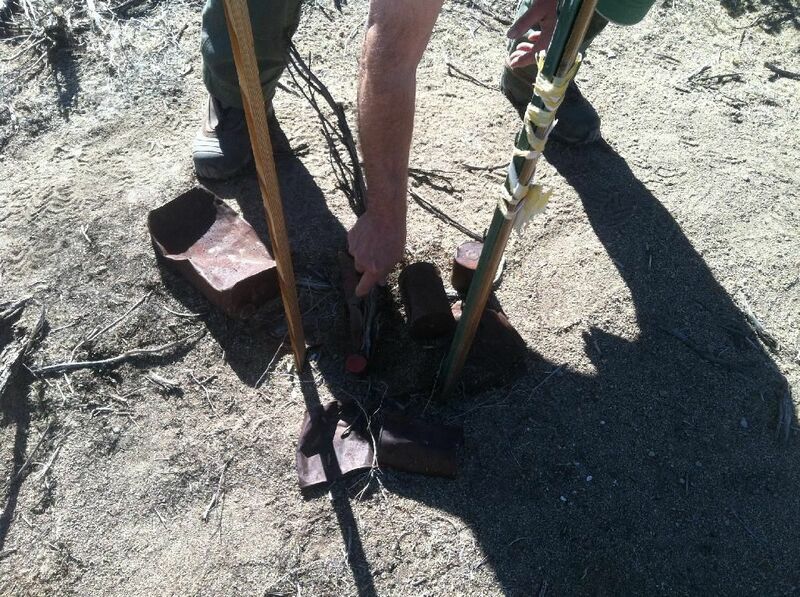 The whole property has been staked, surveyed, and corner posts in the ground so there is no question. Benton Crossing and highway 120 intersection center screen is all included. The NE corner is also straight ahead near that dirt road leading up into the Glass Mountains. Lots of flat land too. Almost everything you see is this land for sale. In the bushes we found an old wagon trail with a large can and bottle dump. Closer shot of the adjoining neighbor and his land. Hiking the property line down to the truck. Jeep Cherokee is not included in sale, it is personal property and will be removed. Vandals have left their mark. From the Cherokee there is a popular hiking trail that leads to summit over looking White Mountains and Benton Hot Springs. Up we go. 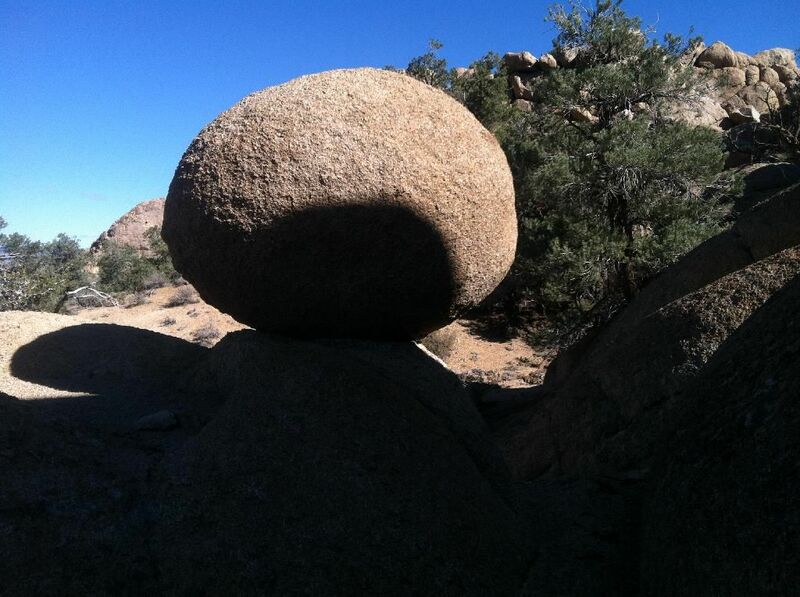 About a 1/4 we hike up and eventual leave our land and cross into BLM lands. This is where is starts to get very interesting. At the summit we get some good views of the Whites, Blind Spring Hills, Yellow Jacket Indian reservation, and Benton Hot Springs. The trail continues down to a water source below in the canyon but we turned around here. More views over the rocks towards Benton Hot Springs and highway 6, Boundary Peak, and Nevada. 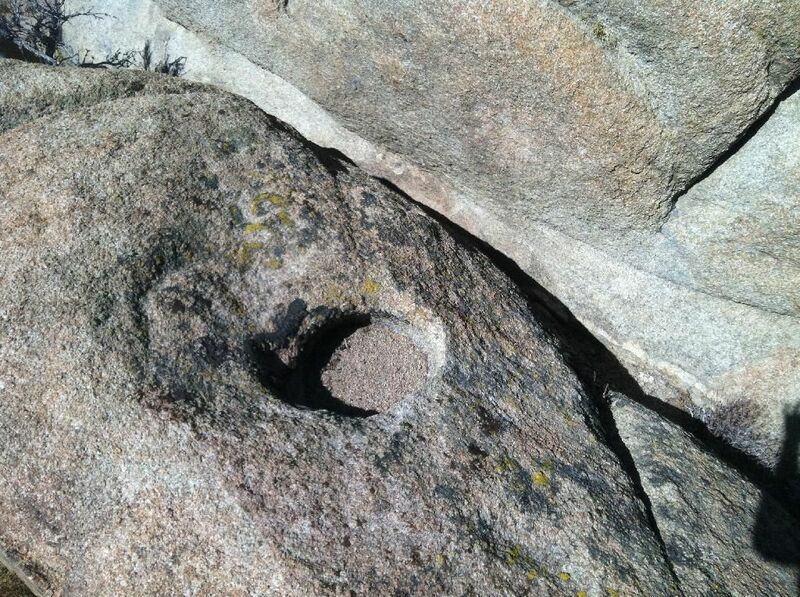 Survey marker for NW corner. State highway 120 to Yosemite cuts right through the land. 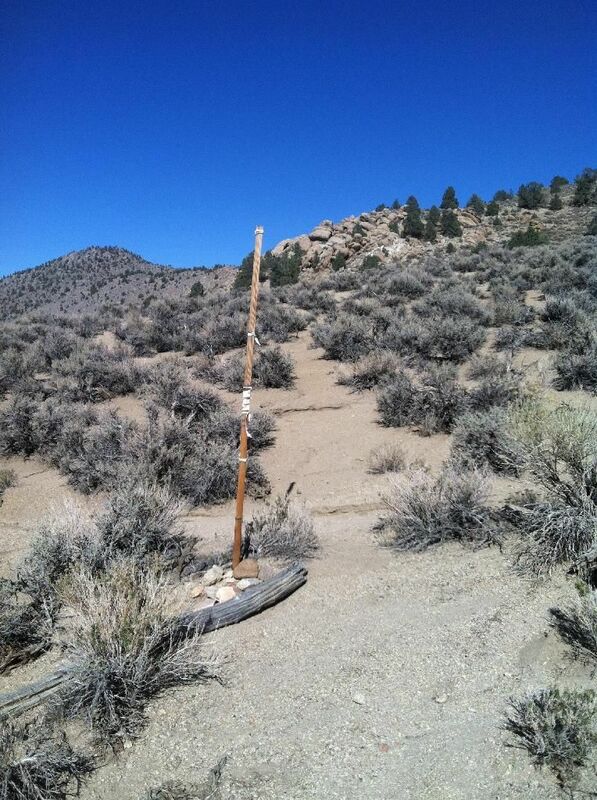 This is the 120 coming up from Benton Hot Springs and the mountain top to the right is part of the land. Congratulations if you've made it this far! Next up is just some discussion on potential of this property, zoning allowances, land ownership, and other ideas. 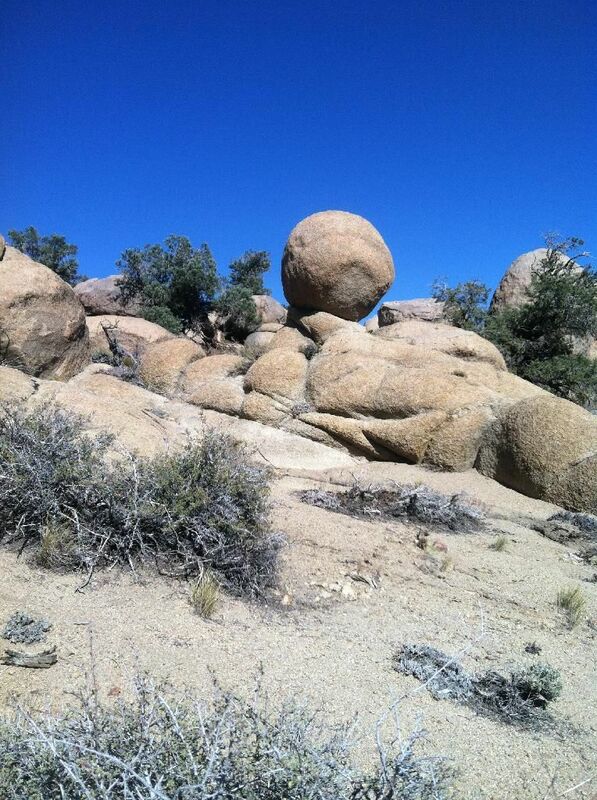 As mentioned above, this property is close to Mammoth. 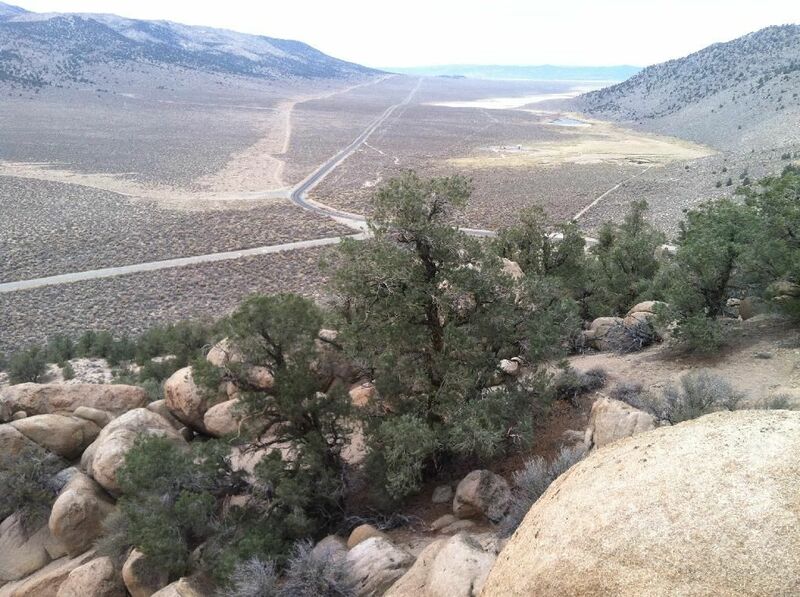 Take a look at our local real estate listings and you will see that vacant land in Mammoth starts near $175,000 for a small neighborhood lot, maybe 1/4 to 1/3 acre. 40 minutes although a commute, is done on a daily basis by many who work in Mammoth either coming from Bishop (and beyond) or Benton. One might wonder, well if this is such a great property why don't you keep it for yourself? A very good question and the answer is this: we have many properties, cabins, shacks, trailers, mines, fruit trees everywhere and we are starting to find ourselves spread thin. Most of our holdings are in constant need of maintenance and we are having a tough time keeping up with what we have. 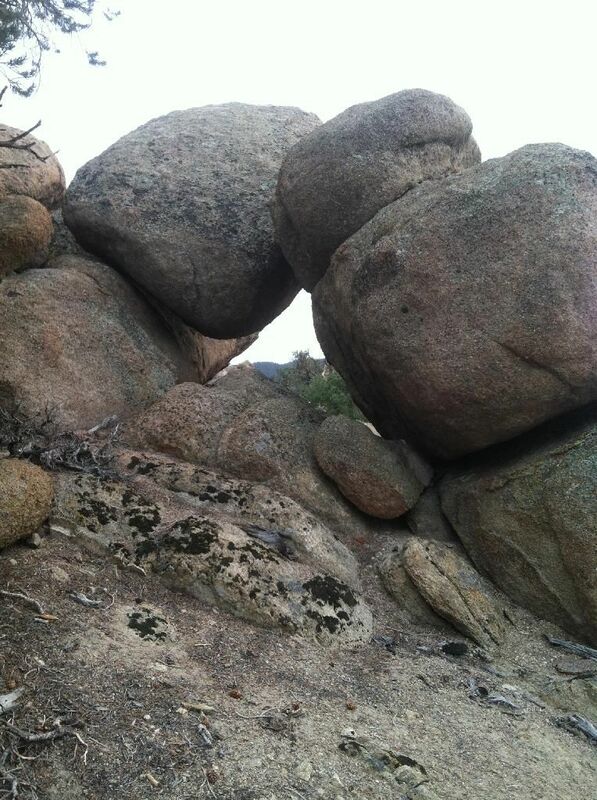 Of course, our first thought was to improve this property and build a hidden cabin up in the boulders, but realistically we can't - don't have the time. Joint venture: we've done them twice and they work. It is a good way to share in the cost of property if you are on a budget. Because the property is able to be split into three 40's it makes sense for three families (or three family members) to divvy it up. Split three ways this property would cost each party about $10/day. 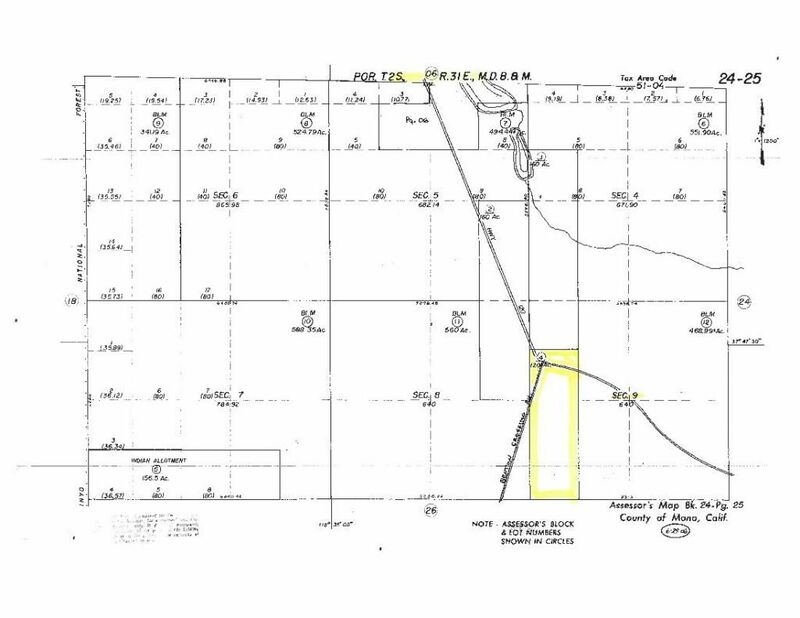 Zoning: Resource Management (RM) click the below link to view on Mono County's website, it is too much to cut and paste. 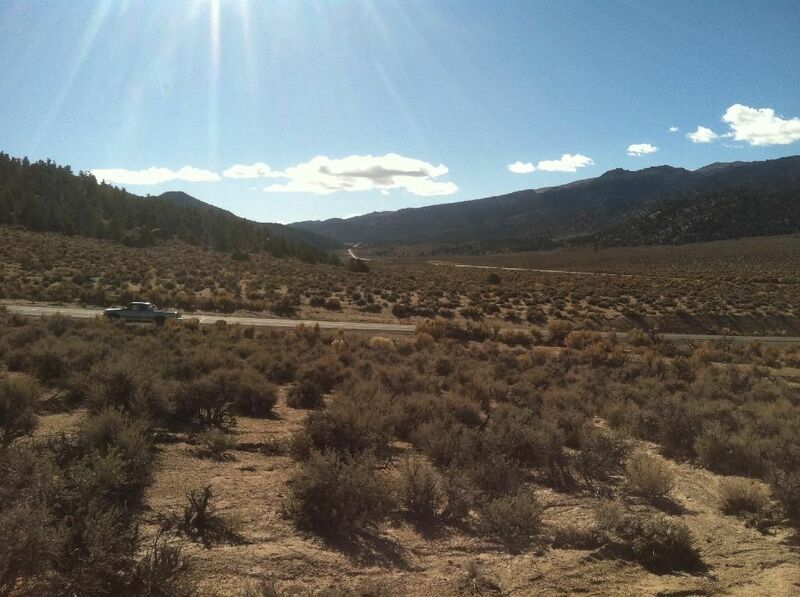 Besides being zoned for a home, the most interesting components of RM include limited small scale lodging like rental cabins, bed and breakfasts, etc, and the permission to create recreation facilities that require the modification of the natural landscape such as cross-country ski trails, bike trails, etc. 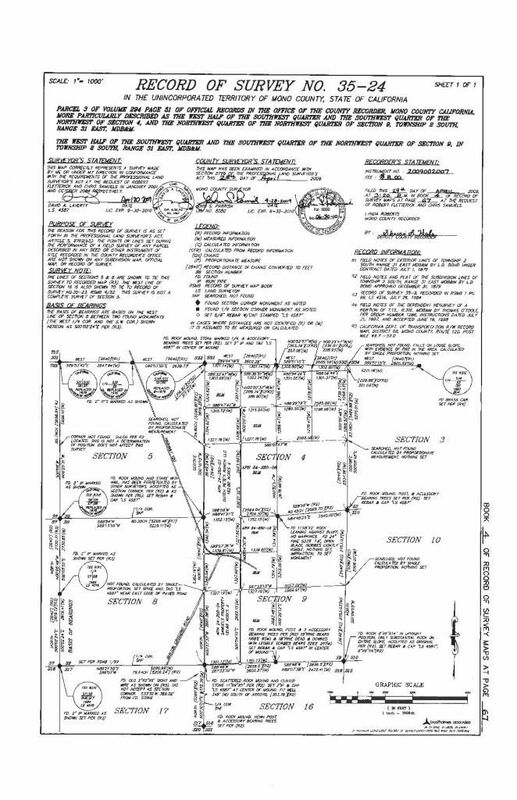 Another thing I noticed was that the neighbor on one side subdivided his RM lots into smaller than 40 acre parcels, he has some 10 acre lots listed at $100K. How did he do this? I asked the county directly and they told me that it was money. With money you can get your zoning changed and that's what happened. Good to know, but no thanks. Lastly, a few thoughts on land ownership. Obviously it isn't for everyone, some people think it is a joke and that's fine. Everything we've ever made has been invested in acreage as we trust it way more than stocks off wall street or 401K's. At the end of the day you can drive out to your land, camp-out, hike, shoot, or build something out of the way of prying eyes and neighbors. 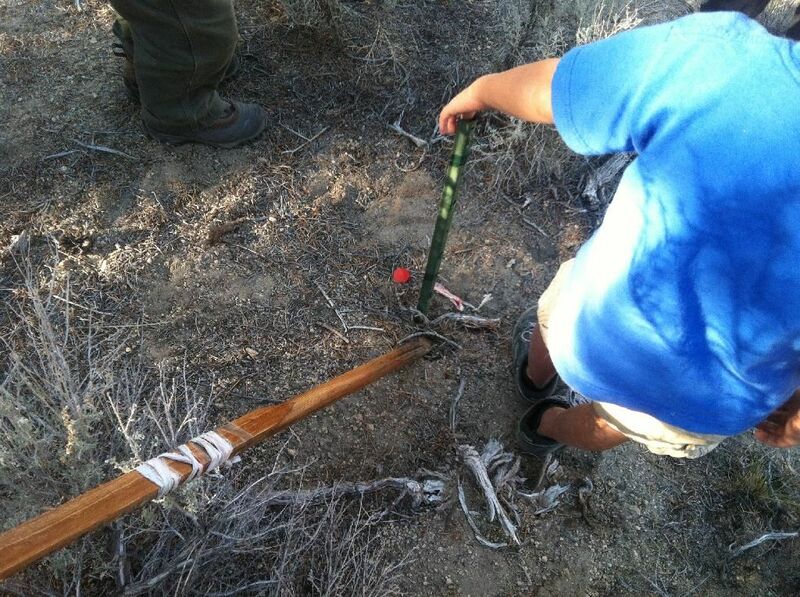 You can welcome people to use your land or tell them no trespassing. You can rent it, sell it, or hold it. Build if you want, or just take your time designing the plans. Anyhow, if you stay with us at hilton creek and want to view this property we'll take a 1/2 day and show it properly. It is easy to locate on your own too. Just let us know. 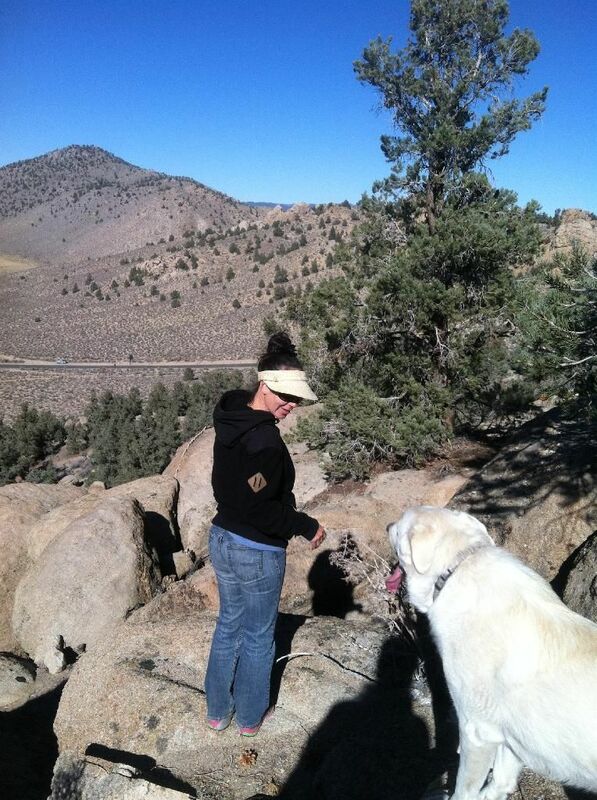 Added a google earth file below of our hike along the top mountain ridge of the property. None of the corners are marked on this file, we just wanted to walk most of the NE edge. 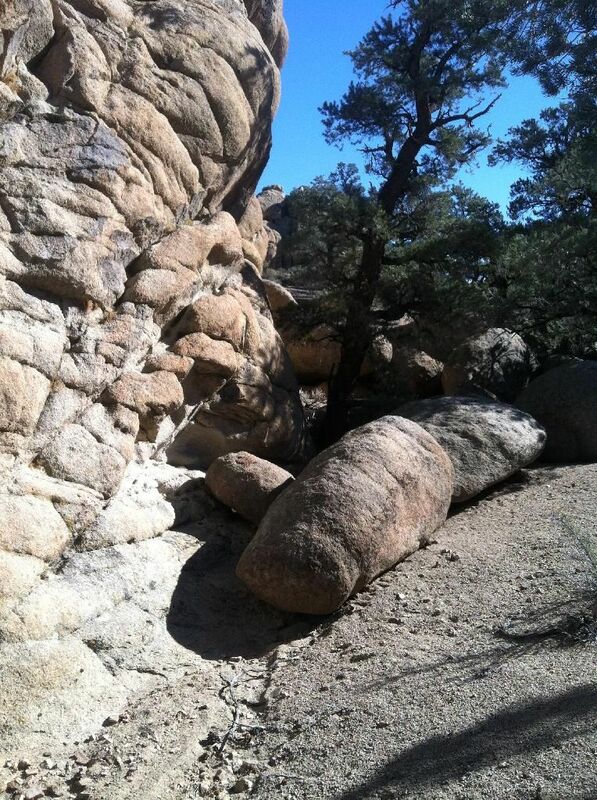 See if you can find the orange Cherokee, we hiked right past it.